Well I’ve been absolutely swamped this year with tons of hand stamped orders and have also been busy teaching some Abstract acrylic art classes as well as some abstract pallet paint nights but now is the time for a “break”. I truly wish I could say I was doing something exciting during these lovely summer months but I’m not. What’s the reason for the break? 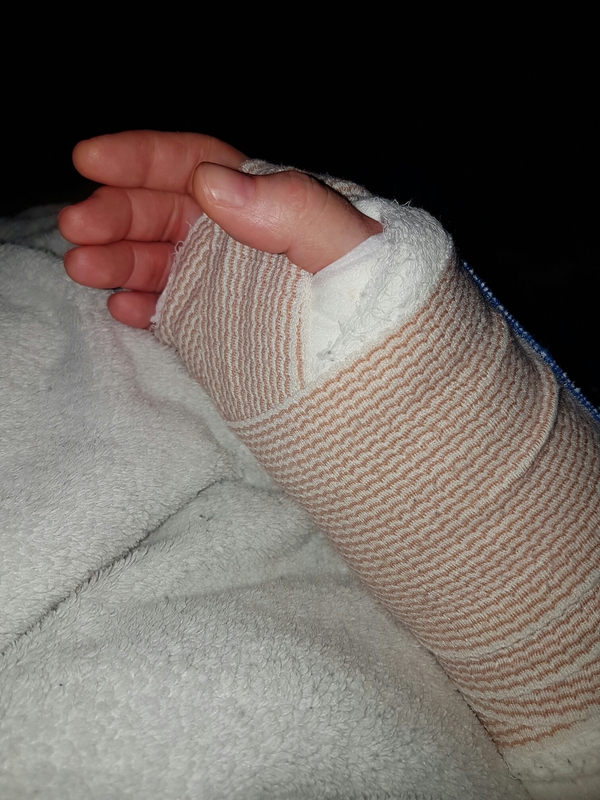 Hand surgery…not very exciting but necessary. One of the down sides about being an artist is the extent to which my hands take abuse. I have severe carpal tunnel in both my hands and have been delaying the surgery for 4 years now. I have 2 good excuses though one is called Zoë and the other is Prudence haha. Everytime my surgery came up I found myself pregnant so it got pushed back twice, now that the girls are older I decided I better get it done before I have too much permanent damage. So now I have 6 to 8 weeks before I can resume creating assuming things go smoothly. Tomorrow I get to take the packing off to see how badly they butchered me so that should kill some time…maybe!?! This entry was posted in Uncategorized on July 5, 2016 by Amanda. Guess u r gonna have to be still for a bit of time! Maybe this is a time to catch up on reading some books that have been on your list? Do u get into crossword puzzles or seduko, or jigsaw puzzles? When u up to it, would be interesting to see how your left hand manages a paint brush, etc. Just some ideas that I tried to fill in the hours when I broke my right arm earlier this year.